"Waterhouse" was the reply to Nick's question "Charlie who?" and Joan explained that she is the niece of Charles Waterhouse and retains his collection of cups and medals won in motorcycle competitions. 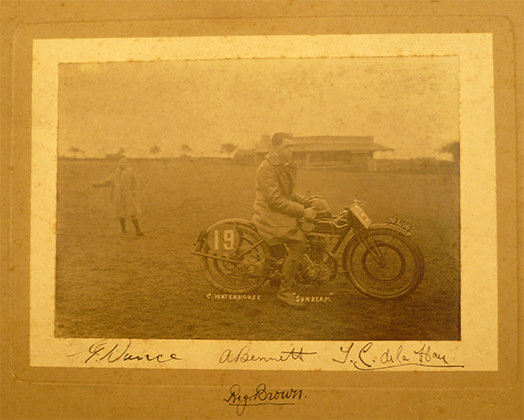 As a private entrant, riding Sunbeams, he rode in six Isle of Man races, competed at Brooklands, Southport Sands, and had class wins at the last public road speed trials. Nick established that Joan and her husband Colin lived in Greater Manchester, and they kindly gave permission for me to visit them and view the collection. Waterhouse, in Douglas, Isle of Man before the 1923 T.T. "The Heaton Moor Motor Cycle Club wish you every success". 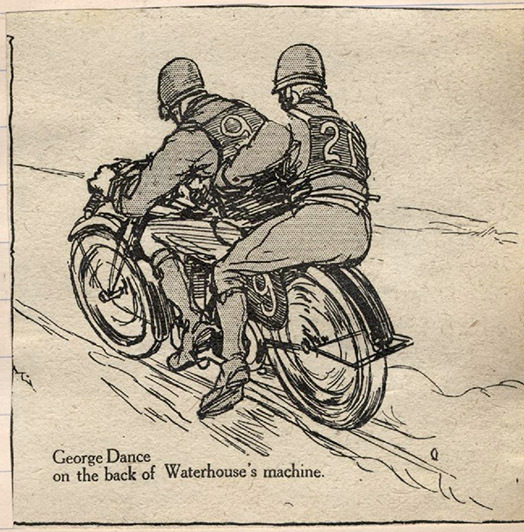 those years, is splendidly illustrated by the drawing showing Waterhouse giving George Dance a lift to the Bungalow, after he had broken down on the mountain climb, on the last lap, when leading the 1923 Junior T.T. 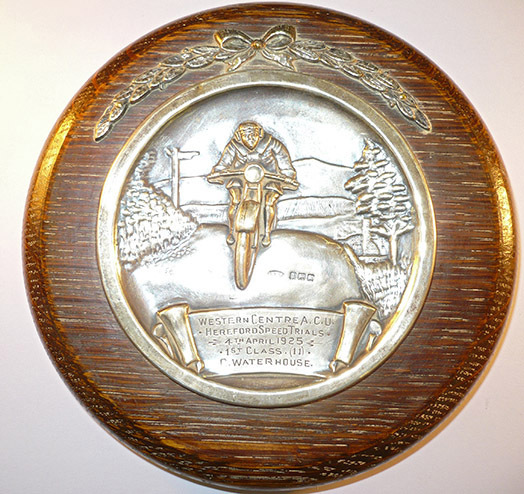 Historically, one of the most significant items in the collection is the pair of awards for '1st in Class' (11 & 14) at the Western Centre A.C.U. Hereford Speed Trials held on Saturday 4th April 1925. This was the last motorcycle speed event held on public roads in that era, following the incident at Kop Hill on the previous Saturday which had caused the R.A.C. & A.C.U. to cancel all further permits for speed contests on the open highways. The promoters of the Hereford event really seem to have marked this "end of an era" with a particularly impressive memento. Waterhouse continued to compete in sand races at Southport in the west and Saltburn on the east coast: and also in sprints held on private roads. In 1926 he made fastest time of the day at Walney Island and set a new course record; and at Gopsall in 1927 tied for best solo time. He rode in the Senior T.T.s in 1925 and 1926; the latter which proved to be his last Isle of Man ride, was the one occasion when he failed to complete the course. Sadly, after eight years of successful competition, this enthusiastic amateur contracted T.B. and spent a long period as a patient in a North Wales sanatorium, where he died shortly before his 25th birthday. He is buried in Stockport cemetery. I am very grateful to his niece Joan, who has not only enabled me to record the collection for the M.S.C.& R. archive, but has shown such pleasure to find that there are enthusiasts around showing interest in her Uncle Charlie's achievements.